We’ve never had a formal investor meeting at 7 Generation Games, but we got lucky today with two of our investors dropping in at the same time to give us advice. Tom was in town from the Midwest to give Maria and I some feedback on our sales and marketing. 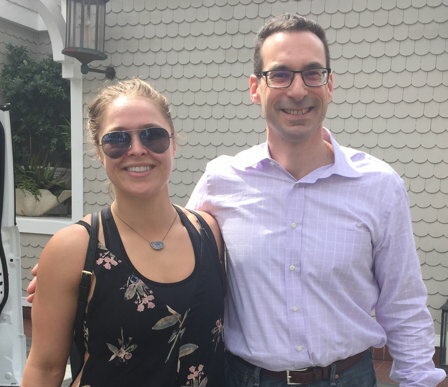 Ronda just happened to be in the neighborhood and dropped in. Since that was the CEO, President and two of our investors, it’s the closest we’ve come in our four years of existence to an investors’ meeting. I couldn’t get a picture of all four of us together because we were holding up the line at the valet but here are Ronda and Tom. So, what did we discuss? Mostly, my need for a clone. I’m doing coding on the latest game, Aztech, revising an article on results of our prior grant, Dakota Math, for an academic journal, writing the final report for the Phase I grant on another project, Crossroads, traveling around the country to meet with schools to do demonstrations of our games, speaking at two conferences this week. Oh, and we are having meetings about a reality show on our company. Ronda had given us some really good ideas for game improvements the last time we met, and we still haven’t included nearly all of those because – see previous list. At any given time, I have over 1,000 unread email messages – and that is with knocking out hundreds a day. You know, don’t you, that if you did have a clone, that other you would just go out and found another company. We will be hiring a full-time, entry-level sales person to help me with sales, and another software development intern to help with coding. I guess that’s the next best thing to a clone. Job announcements should be up in the next day or so. Buy our games. Learn multiplication, division and fractions. Try not to die. Glad to read and see the investors are caring and sharing. I love knowing you guys are meeting, and hammering out things that need to be done. I imagine growing businesses are like children. Your business dream baby is now four years old! I will throw in more prayer for all of you.